One of the best five-mile loops in the area offering a gradual uphill climb to a flowy technical descent. This is one you’ll want to do again. Each loop won't take very long, but you can do as many loops as you'd like. Adams Camp offers one of the best five-mile trail loops in the area. Located in Stowe, a historic town and home to Vermont’s highest peak, Mt. Mansfield, the loop, made up of Hardy Haul and Kimmers trails, sits on 513 acres of hardwood forest. Owned by Trapps Family Lodge, the land was conserved in 2006 by the Stowe Land Trust to provide non-motorized public recreational access and wildlife habitat protection. 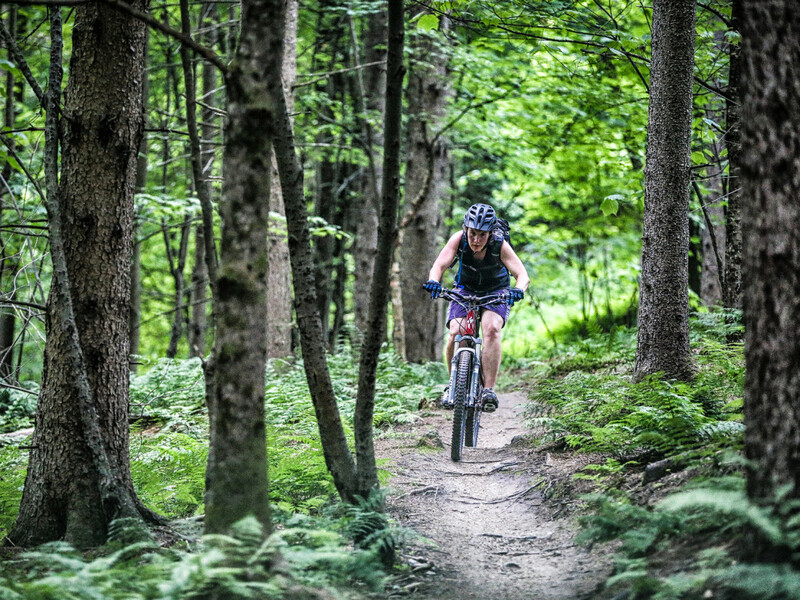 The trails themselves were built between 2009-2011 by a partnership amongst the Stowe Mountain Bike Club, Stowe Land Trust and the Town of Stowe. They are multipurpose trails and used by hikers, bikers, runners and other outdoor enthusiasts. Both Hardy Haul and Kimmers are singletrack trails built with the mountain biker in mind. The 2.2 mile ascent up Hardy Haul is full of switchbacks making it a fun gradual climb that isn’t overwhelmingly steep. It is a machine-built trail making it relatively smooth and allowing for an extremely fast descent should you decide to turn around at the top and head right back down rather than continuing on to Kimmers. Kimmers is 1.3 miles in length, and, like Hardy Haul, can also be ascended or descended, however, it was created as the downhill portion of the loop. Riders will find this trail to be much more technical than Hardy Haul. It’s flowy and contains many twists and turns, bridges and obstacles. The trail is riddled with rocks, large and small, and has a couple of rock roll-overs on the way down. It’s a tricky ride and will challenge riders’ skills. Adams Camp also provides access to the numerous other trail systems in Stowe, including Trapps Family Lodge, Pipeline and Cady Hill so riders can make their outing as short or as long as wanted. Information on the different trailheads can be found at the Stowe Mountain Bike Club and maps of the areas can be purchased at a variety of local shops. Because the Adams Camp loop is so fun riders will oftentimes head back up for another loop to extend their ride and fun. When the day is done head out to the Matterhorn located at the end of Ranch Brook Road. They are known locally for their great pizza and sushi. Great for grabbing a beer and relaxing. Intermediate and advanced riders looking for a really fun ride and a nice mix of smooth and technical terrain will love this loop. A favorite of locals, this loop stands alone, but if riders are looking for something longer it is easy to connect to the other trail systems for an extended ride. Park on Ranch Brook Road, left after the Matterhorn bar and restaurant. Drive down Ranch Brook past the red house and continue .25 miles to the parking area by the bridge. Parking is free. If you decide to connect to other trail systems off of Adam’s Camp, please note that the Trapps Family Lodge trails are pay-to-play and you will need to buy a pass to ride these.